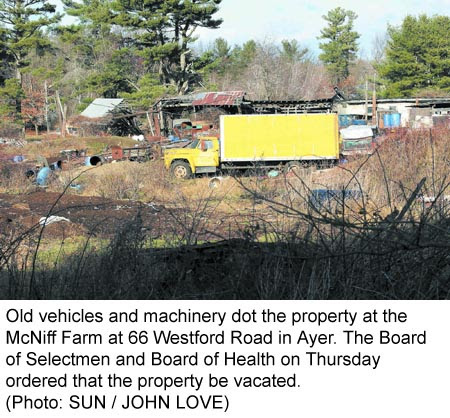 MASSACHUSETTS -- The question of whether the 5-acre parcel at the intersection of Westford and Loon Hill roads, zoned residential, is a farm or a junkyard continues, according to the boards of selectmen and health. Board of Health Chairman Margaret Kidder said they received a letter from Building Commissioner and Zoning Enforcement Officer Gabriel Vellante stating there are no zoning issues with the property because it is considered a "non-conforming" use. 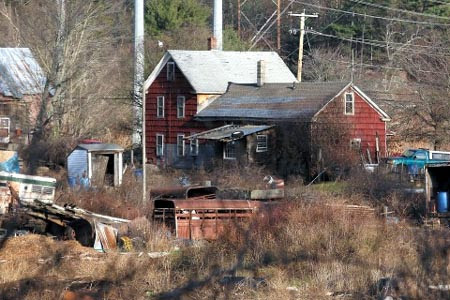 Kidder disagrees, stating there is a zoning issue due to the number of unregistered abandoned vehicles on the property. "The building commissioner basically threw the Board of Health under the bus," health member Mary Spinner said. Health agent Bridgette Braley and Spinner went out to inspect the property but the owner, Ralph McNiff, would not allow them onto the property. Braley and Spinner looked at the property by standing on the property line of Orion Industries. "There's a Dumpster on the property," Braley said at the Board of Health's Sept. 22 meeting. "I'm not sure how long it's been there. There's also an old Ryder truck that doesn't close that's filled with trash." Braley wrote a letter to McNiff, on behalf of the board, instructing him to inform the Board of Health within seven days of how he plans on cleaning up the property. Resident Laura Haines suggested at the Sept. 23 Board of Selectmen meeting that there might be another way to handle the situation. "I'm wondering if anyone has asked Mr. McNiff if he needs help," she said. "I would voluntarily help him any way he needs. Instead of everyone going at it tooth and claws, I for one would be perfectly happy to help." Former selectman Frank Maxant asked the board if they had shown the "common decency" of letting McNiff know his farm was going to be on the agenda and if Braley knocked on his door and asked to look at his property. "Ralph McNiff has been operating his farm for years," Maxant said. "The things on his farm are healthy It's all completely backwards. It's like Alice in Wonderland." Former selectman Frank Maxant then told Bill Principe, the resident that initially questioned the farm's status, if he didn't like the farm he shouldn't have moved there and handed him a "House for Sale" sign. "Sorry if I raised a fuss over this," Principe said. "I still don't believe he is operating a farm. 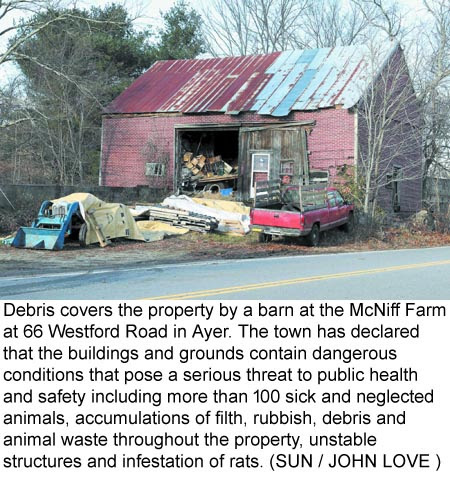 [The town of] Ayer deserves better." Principe, saying he appreciated Maxant's point of view, handed him 75 cents for the sign. While those in the meeting room appreciated some of the humor around the "for sale" signs, Selectmen Chairman Carolyn McCreary brought the discussion away from selling any properties. "I would like to bring this discussion back to facts and away from opinions," she said. "We have regulations we need to follow and we have to find out if violations are in fact happening. If they are, we need to fix them." Braley has requested copies of the Department of Agriculture's inspection reports of the property, but isn't sure if the reports are public records or not. "Barn books are not public record," she explained to the Board of Health. "So, we have to wait and see if the inspections reports are public record or not." McCreary tabled the item at the selectmen's meeting without giving a specific date as to when the discussion would resume. "I would like to suspend discussion until more investigations are done," she said. "I would also like all the proper parties to be here for future discussions." 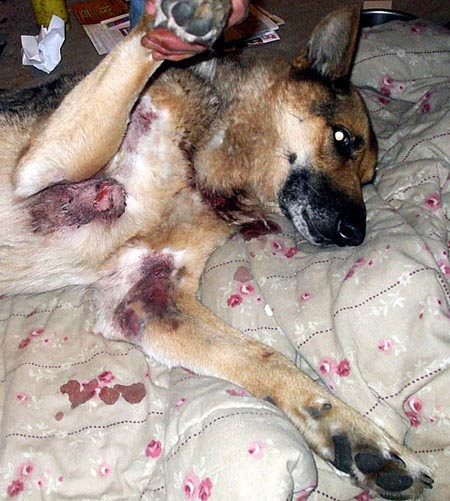 Indiana: Tony Burden begged police to shoot his pit bull after it attacked him. Even his wife, Miriam Engelhardt, beat on the dog with a baseball bat and couldn't stop the attack. INDIANA -- Evansville police shot and killed a pit bull late Thursday night after the dog attacked its owner. According to Officer Tyrone Wood, the incident occurred at 409 E. Eichel Ave. around 11:30 p.m.
Wood said when police arrived, in response to a 911 call, the living room floor was covered in blood, the dog was ripping the arm of owner Tony Burden, 24, and a woman identified as Burden’s wife, Miriam Engelhardt, was screaming “He won’t let go” and hitting the dog, Brutis, with an aluminum bat. Burden was shouting, “Help me, shoot him,” according to a police report. Burden was taken to Deaconess Hospital with arm wounds and was in fair condition today. Engelhardt told police Burden, who had been outside arguing with a neighbor, was attacked by the dog after he came inside and sat down in a living room chair. AMR and the Evansville Fire Department were dispatched and the animal was picked up by Animal Control. MAINE -- Shannon Lee, the owner of two pit bulls who were put to sleep on Monday after escaping her home and attacking a neighbor’s dog over the weekend, says she is upset about how the town’s animal control officer handled the situation. “I was told I had no choice,” she said. Lee’s two pit bulls, Madison and Money, were put down at Penobscot Veterinary Hospital on the Davis Road in Bangor. Kathie Ricker, the town’s animal control officer, said seizing pets is always a touchy issue, but because Lee agreed to allow the dogs to be put down, she gave up her rights. Ricker said the town paid for euthanizing the dogs, which by law is the responsibility of the owner, because Lee didn’t have any money. Lee, who is a 20-year-old single mother, said she recently was given the dogs and took them because she wanted to give them a good home and because Madison was pregnant and she wanted to make money selling the puppies. She added she attempted to get the rabies vaccination records, but the family that gave her the dogs had moved to Florida. After her dogs attacked a neighbor’s German shepherd on Saturday night, Lee was issued six tickets, two for dogs at large, two for dangerous dogs, and two for unregistered pit bulls. The typical fines for dogs at large and unregistered dogs is around $50, but range between $250 and $1,000 for dangerous dogs, Ricker said. Lee said paying the fines will be difficult and added that she feels like a villain when all she was trying to do was save the dogs and help support her family. Lee has four puppies remaining out of Madison’s litter of seven that she plans to sell once they are old enough to make money to pay the fines and her neighbor’s vet bill, she said. Three of the puppies already have been placed with friends. “Had we been able to quarantine them, they still would have had to be euthanized” because they were dangerous, Ricker said. “It’s a shame what happened, but it would have been worse” if someone had been hurt. MAINE -- Two pit bulls were euthanized Monday after they escaped from their owner’s house on Route 2 on Saturday and attacked a neighbor’s dog, according to authorities. Jack was bleeding profusely when Babcock took him to the Eastern Maine Emergency Veterinary Clinic in Brewer on Saturday. He was unable to walk Monday, and the vet bill totaled more than $500, Babcock said. The pit bulls’ owner, Shannon Lee, was upset about the decision to euthanize the dogs, but voluntarily complied when asked to do so by the town and the town’s animal control officer, Kathie Ricker. “This afternoon, I escorted the owner and the dogs to Penobscot Veterinary, and they were put down,” Ricker said. Lee, who is not facing any legal charges stemming from the incident, did not return a message left on her answering machine Monday. That's the only reason she agreed to euthanize them; they promised not to file criminal charges against her if she agreed. She'll just go out and get two more pit bulls... and start breeding them too. In addition to numerous complaints about the dogs being at large, Town Manager Tom Richmond said the pit bulls were not licensed and did not have records of rabies vaccinations. A litter of 5-week-old pit bull puppies was not taken from Lee’s home by authorities but are in the process of being adopted, the animal control officer said. Three of the puppies already have been placed in another home, she said. “I don’t think there is anyone who is more remorseful than her,” the animal control officer said of Lee. Babcock said she is sorry that the dogs had to be put down, but is relieved that her family is safe. 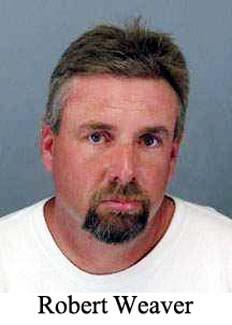 CALIFORNIA -- Police detectives and the Contractors State License Board on Tuesday arrested Lockeford resident Robert Weaver on nine counts of contractor fraud and working without a license. 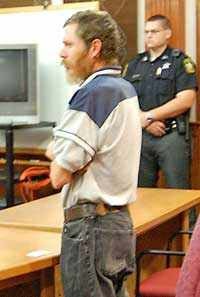 At his 5-acre property in the 15000 block of Linn Road, however, they also compiled three counts of animal cruelty on top of accusations that he defrauded elderly homeowners of at least $60,000 worth of landscaping contracts he did not perform. Authorities found dead 23 dogs and a steer on Weaver's land, which includes his home and a dog kennel, Lodi Detective Lee Patterson said. "I've been on this guy in the past for forgery charges," Patterson said. "I heard that he has 40 dogs on his property, and that just didn't seem right. Every time I contacted the guy, he didn't have a dime. 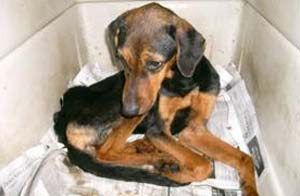 How could he afford to care for that many dogs?" Weaver, 38, is scheduled to appear in San Joaquin County Superior Court on Tuesday. 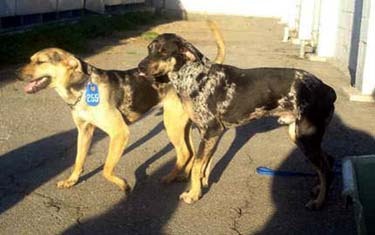 Patterson said the dogs were a specific breed - Louisiana Catahoula leopard dogs. The breed is known for its boar hunting and herding abilities. Patterson said Weaver was selling the dogs. 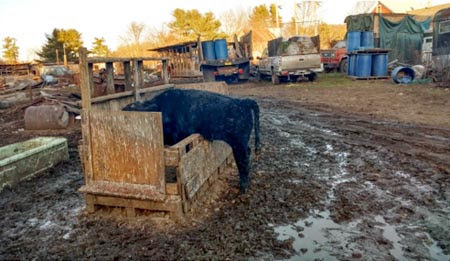 The dead steer was found with his head halfway in a water trough. "You could tell it was trying to get a drink," Patterson said. One police witness, Maria Gomez, said she performed housekeeping duties for Weaver beginning in 2006 and ending in January after his checks began to bounce. Gomez said she still is owed $120 for her services, a small amount she admits, but important to her. She added that she always was bothered by his treatment of the dogs. "I was always told to stay away from the dogs and the kennel," Gomez said. "Once, I wanted to give them water because it was over 100 degrees, and they had no shade. I called, and they said not to worry about it." Gomez said she saw other signs of physical abuse on the dogs, saying Weaver often kicked them or yanked them forcefully by their collars. putting on weight before being found new homes. 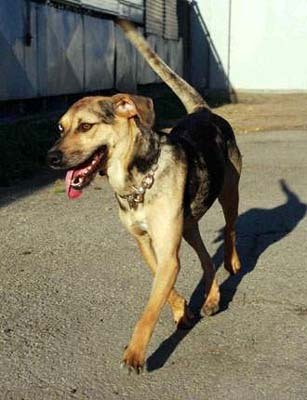 Seven dogs were found alive on the property, six of them Catahoulas, police said. 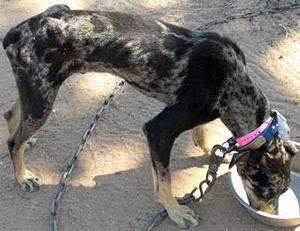 Their bodies were emaciated from obvious malnutrition, Patterson said. www.dogbreedinfo.com. The dogs on Weaver's property weighed 20 to 30 pounds, authorities said. The surviving dogs were taken into custody by San Joaquin County Animal Control, where they are being cared for until they can be adopted. Officials at the animal control office were unavailable for comment Thursday. Weaver was booked Tuesday night into the Lodi Jail and on Wednesday was transferred to the San Joaquin County Jail in lieu of $460,000 bail. He is charged with grand theft, elder abuse and contracting without a license. "This guy just doesn't care ... about anybody or anything," Patterson said. 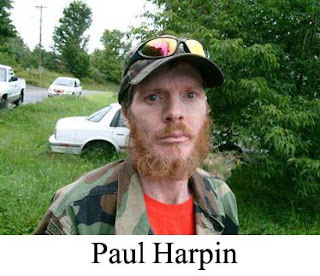 VERMONT -- Pauline Harpin, 70, and her son, Paul Harpin, 41, who share a home on Route 5 in Passumpsic, each pleaded innocent to 20 charges of cruelty to animals during their arraignments Monday morning in Caledonia District Court. Each of the charges carries a maximum sentence of one year in prison, a $1,000 fine or both. In Caledonia County Sheriff's Department Sgt. William O'Hare's lengthy affidavit, he describes receiving a telephone call from Josephine Guertin, the local animal control officer. Guertin described a phone conversation she had with Evelyn Hodsdon, 74, St. Johnsbury, on Aug. 4. Hodsdon is the sister of Pauline Harpin. Hodsdon told Guertin she should visit the Harpin home because the Harpins' animals were dying every day and being neglected. In O'Hare's affidavit, he said Guertin had been in contact with the Harpins a number of times during the years about animal cruelty issues. Guertin told O'Hare she had been threatened by Paul Harpin in the past and she would not return to the residence unless she was accompanied by law enforcement officers. 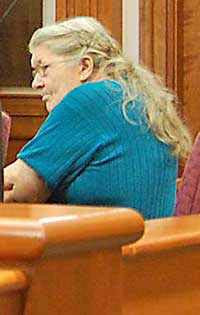 Hodsdon told Guertin that during her last visit to her sister's house in July, she counted 17 cats in the residence. Three weeks after her last visit, Hodsdon's sister said 10 cats had died. Later, Hodsdon learned, an 11th cat had died. On Aug. 6, O'Hare responded to the residence with a search warrant and Caledonia County deputy sheriffs Gaylon Smith, Steve Hartwell and Dana Kalahan. Guertin went to the house along with veterinarian Robert Hicks. 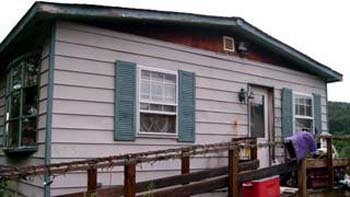 Twenty live animals were removed from the residence. Each of the rescued animals represents one of the 20 charges of animal cruelty lodged against each of the Harpins. Rescued were five cats, a speckled lizard, a pot bellied lizard and a tan lizard, a white Geco, a tarantula, a tortoise, a ball python, a hamster, a brown and white mouse, a guinea pig, a chinchilla, two ferrets, a rabbit and a dog. Inside, a number of dead and decaying animals were found, with 15 frozen animal carcasses alone discovered in the freezer. 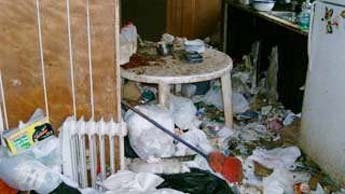 According to court records, the house was infested with fleas and black flies, and rotting garbage was heaped up everywhere. 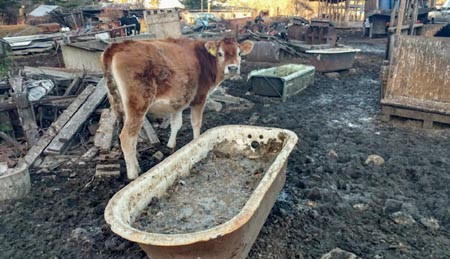 The animals were kept in inhumane conditions and demonstrated severe neglect. According to O'Hare, the Harpins surrendered all of the animals to the town of Barnet. After the Harpins entered innocent pleas, they were released on conditions, including they not possess any firearms or dangerous weapons; they have no contact with and not harass or abuse Evelyn Hodsdon or Josephine Guertin; they make an appointment to meet with a mental health counselor from Northeast Kingdom Human Services; they not have any animals in their residence; and that they allow periodic inspections of their residence by a humane officer. The animals rescued all received medical attention and most have been placed with new owners.